Giveaway ends June 11, 2016. Solaris Mortem is available now on Amazon for pre-order. Thank you, beta readers for your input! It's been invaluable, and your final copies are on their way very soon. 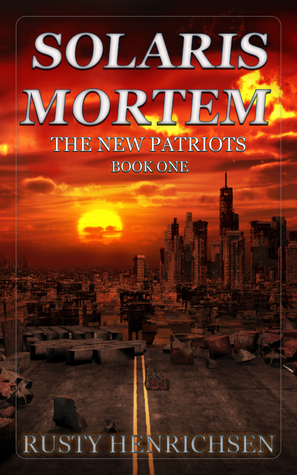 You can pre-order you copy of Solaris Mortem:The New Patriots HERE. Book One of the planned trilogy, Solaris Mortem, is nearly ready. ARC copies are going out next week. Contact me if you'd like to be an ARC reader. Six weeks ago, this draft sat at 25,000 words, just as it had for the last two years. What happened? A lot, I guess. I let go of some anchors that had been holding me back. Not physical anchors, but the bad kind: emotional. It's all too easy to find excuses not to write and I latched on to them—tight. No longer. I made writing a priority, no matter what. I set my goal low: 500 words per day of fiction with the goal of working up to a 1000 per day. I started low to avoid failure, with the requirement that it be done everyday, no matter what. I’m at 700 words per day presently, and it takes an hour or less most days. It's not breakneck speed or an incredible word count everyday, but it is steady progress. I'm grateful for that. We moved back to town from our off-grid paradise. That part is bittersweet, but let me tell you, living off-grid and working full-time, leaves you with no time. A writing habit requires your time. There’s no two ways about it. You either make it a priority, or you don’t. Results may vary. And lastly, some of the credit goes to Ulysses writing software. I finally found the right one for me. I've written by hand, on typewriters, dedicated word processors, Scrivener, Word, and Storyist. They're all good. They all have their strengths, but Ulysses is the one that was written just for me. No frills but entirely powerful. Finally, I am home. Check it out. You’ll probably love it. But most importantly, write everyday. No matter what.